The latest in anti-wasp technology has a lot more legs than it needs to, and much sillier hair. Professor Sekine from Utsunomiya, Japan is building a robot that can spray wasp nests with insecticide, thus keeping fleshy humans safe from the wasps' cruel stings. But rather than build a remote controlled helicopter with a can of bug spray strapped to it, or something equally simple, he's working on a humanoid robot with a mohawk that can climb ladders. Sekine started working on the robot when a friend who was involved in local pest control efforts asked him to come up with an alternative to getting up close and personal with the nest. 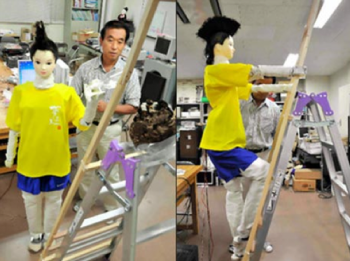 Clad in a bright yellow t-shirt, the robot - named Mohican, after its hair - is around 5'6", made of lightweight metals and wood and powered by small motors. The operator can issue commands to Mohican, such as "climb the ladder," via a small microphone and then remotely control its finer movements. The robot's hair, which started off on a barbershop mannequin, is supposed to look silly, so that people realise that the robot is friendly. Mohican should go into action next spring, once people have had an opportunity to train with it. Japanese wasps are actually more like hornets, and getting stung can in some cases lead to hospitalization, so it's not hard to imagine why people might want a better way to deal with nests than a ladder and nerves of steel. Even so, Mohican is an astoundingly impractical solution to the problem, when dozens of more elegant - and cheaper - options are available. Plus, I'm not entirely sure that teaching a robot to kill is such a good idea. Sure, it's just wasps in the beginning, but where does it end? The utter subjugation of the human race, that's where.